Smartphone eForm integration combines mobility with enterprise eForm processing into one Enterprise Content Management system. "I'm excited that VisualVault Selected the Zappix mobile forms solution for integration into their ECM Document Management suite,” said Zappix Chairman, Avner Schneur. Zappix, the Smartphone Visual IVR provider and VisualVault®, a leading ECM software solutions vendor, announced today integration between the Zappix Visual-IVR solution and the VisualVault ECM product suite. These leading edge technologies will empower users of smartphones and tablets with seamless integration between eForms, workflow, document management, and reports, merging mobile data collection with powerful enterprise content management and extensive analytic capabilities. Combining these innovative solutions frees users to focus on using information to drive growth, automate business processes, improve customer service and lower costs. This integrated offering enables a better and smoother workflow experience through the data and document management lifecycle, from the creation and editing of mobile forms through the administration, storage, and data management of the content. "I'm excited that VisualVault Selected the Zappix mobile forms solution for integration into their ECM Document Management suite,” said Zappix Chairman, Avner Schneur. “The joint offering provides a powerful end-to-end solution where data flows from the customer's smartphone to the cloud-based ECM software for storage and records management, and then back to the smartphone for display. The flow is instant and highly intuitive, following the natural way electronic records management and records life cycles function. This is a very powerful capability, that improves the customer experience, promotes greater user satisfaction and helps enhance a company’s Net Promoter Score (NPS)." "Recent customer service research emphasizes how today's customers demand effortless customer service over a range of touch-points and communication channels," added Gal Steinberg, Vice President of Marketing for Zappix. "In response, companies are looking, more and more, to deploy and maintain mobile touch-points that meet their customer expectations and their business goals." 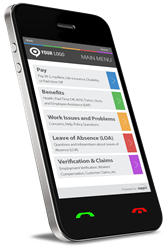 The easy-to-use Zappix Smartphone Visual-IVR platform, combined with the robust ECM functionality of VisualVault, provides a better, smoother workflow experience throughout the data and document management lifecycle for mobile users. It gives organizations the ability to extend their already powerful Zappix IVR with the extensive solutions of VisualVault, expanding ECM directly to the graphical interface of the smartphone. An inexpensive and fast-to-deploy solution, it places both capability and convenience at the customer’s fingertips. The Zappix cloud-based Visual-IVR platform is a SaaS (Software-as-a-Service) solution for web or cross-OS mobile app, omnichannel, customer service communications. It allows the rapid deployment of a highly intuitive, extremely interactive smartphone Visual IVR app that improves the customer care experience, reduces contact center costs and increases a company’s Net Promoter Score™ (NPS). The Zappix Smartphone Visual IVR and mobile self-service solution has grown rapidly and currently provides hundreds of contact centers with a streamlined way to empower and better serve customers. The continually expanding list of Zappix-supported organizations includes insurance companies, utility companies, banks, internet and mobile service providers, retailers, airlines and government agencies. For more information about Zappix, visit http://www.zappix.com or contact Gal Steinberg, Vice President of Marketing at 781.214.8124; gal.steinberg(at)zappix(dot)com. VisualVault is a private cloud and SaaS-based digital repository that brings a wide range of flexible tools, products and utilities together in one flexible ECM (Enterprise Content Management) ecosystem. This electronic business environment drives the efficient, value-added management of digital assets in highly intuitive ways, allowing both structured and unstructured content to be securely and compliantly captured, archived, modified, shared and leveraged for workflow automation. With a low cost of entry, the system is easy to use (with no IT involvement), requires little training and can be quickly deployed for a rapid return on investment. Through its APIs (Application Programming Interfaces) and API Libraries, VisualVault provides a Developer Zone capability that enables customers to develop and implement customized business processing applications specific to their needs.